William Morrow Paperbacks, 9780062027283, 336pp. The Truth About Love and Lighting is a deliciously emotional story of family, forgiveness, love, and magic from Susan McBride. A lie that Gretchen Brink told 40 years ago comes back to haunt her when a tornado brings together Sam, a mysterious man who can’t remember anything, and Abby, her newly pregnant daughter who is convinced Sam is her long-lost father. Though decades old, when Gretchen’s secrets are revealed, the ramifications will affect them all in ways they never could have imagined. 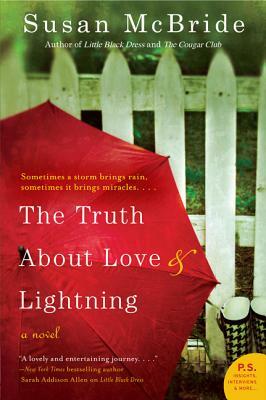 A mesmerizing study of family and love, The Truth About Love and Lightning is touching and observant, reminding us that we never know when our lives are on the precipice of change.